Today is Shannan's (Michael's sister) graduation party and tomorrow is my cousin's! Then Memorial Day we have a pool party at my grandma's-the first of the summer! What are you doing for the long weekend? Anyway. With graduations, come graduation parties. 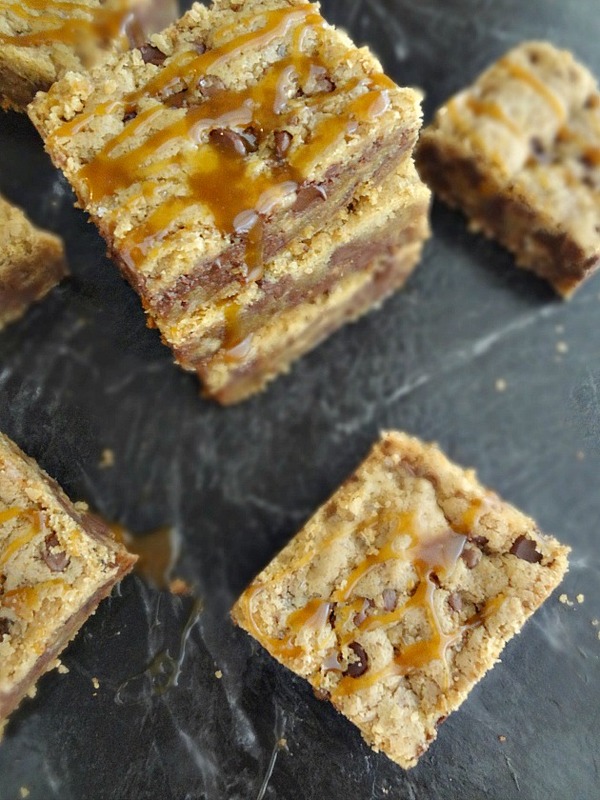 Which are such a fun celebration of the graduate-I'm so excited for Shannan's and my cousins' and I know that, if asked, I would 1000% make these blondies to bring to a grad party. Because they're totally impressive and delicious and if you've graduated high school you deserve something epic to mark the occasion. 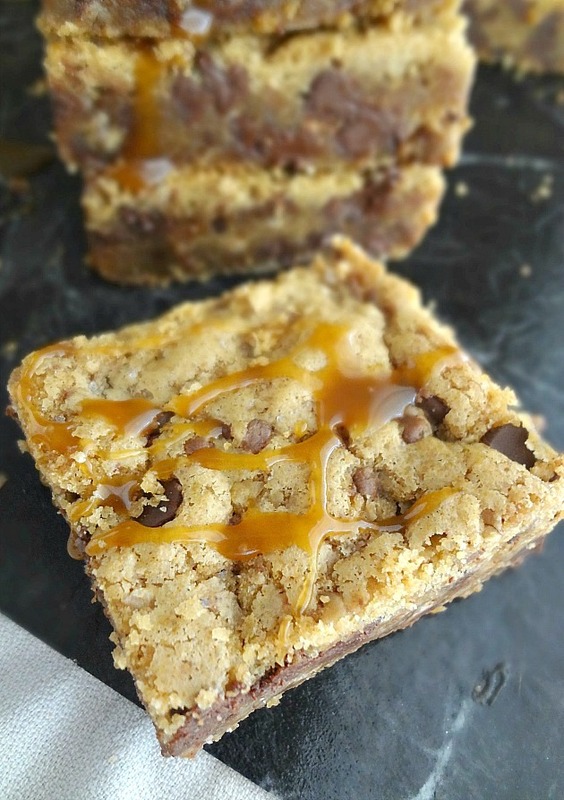 And...I mean...on the practical side--bars/blondies are awesome for parties because you just grab one and go. Not messy and super addictive. Everyone will rave about them! Technically I already gave some of these to Shannan after her last choir concery buuut I mean...I'd make them again for her party! Or just for me to horde and eat by myself while I watch Orphan Black. 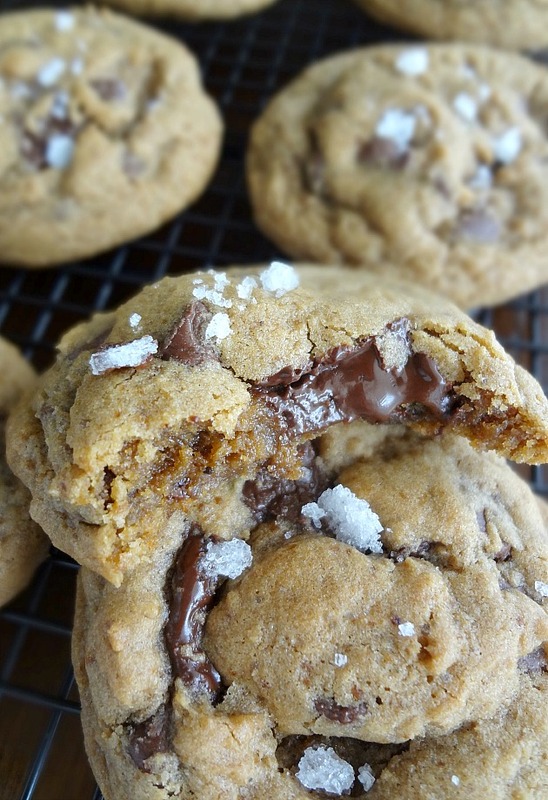 Because they're gooey and chewy and brown-sugary brown-buttery delish. And the toffee adds a bit of delightful crunch. And chocolate gives us life. And salted caramel on top is probably just a necessity, yeah? Yeah I think so too. Soooo I'm a pretty picky eater. Which means I tend to have a set number of dinner recipes that I like and make regularly, which means I oftentimes get tired of them/burnt out. So when I find a new entree to make that I like it is like a GOSH DARNED MIRACLE! And this recipe is one such miracle. 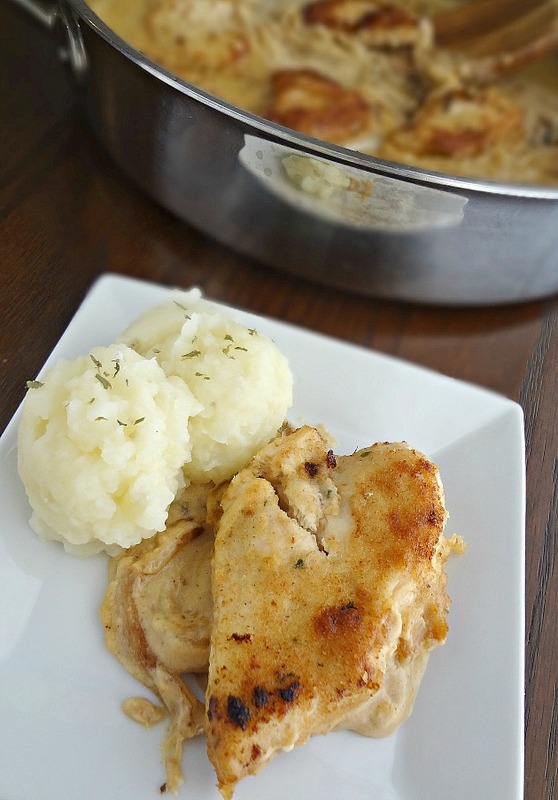 The inspiration for this recipe came from some cheese and onion chicken dishes I've seen on a couple restaurant menus, and that I've even ordered on occasion. But they never really knocked my socks off. So I thought about what could make them better. I decided flattened, breaded, chicken would be tasty. And sauteed onions that are just shy of caramelized would probably be pretty delicious. 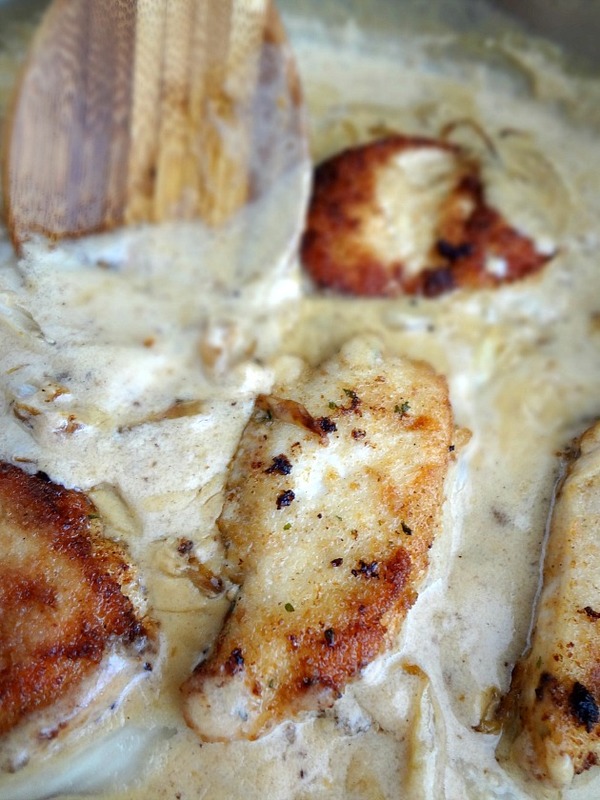 And a thick and creamy and rich cheesy cream sauce...yeah. That also seemed wise. And it was. It so was! 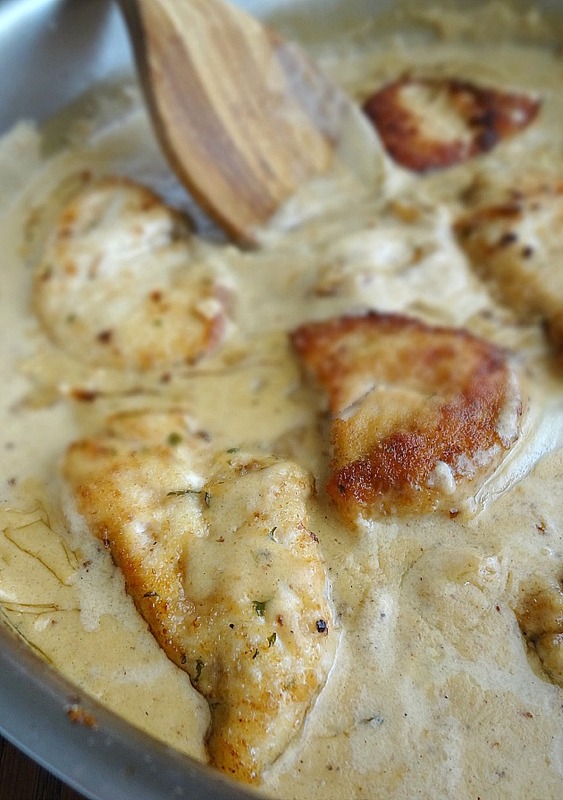 Another beautiful part of this recipe is you make everything in one large skillet--first you cook the onions (then set them aside), then the chicken (which you also then set aside), and finally you make the sauce (which is made all the more delicious because it is partially flavored by the onions and chicken that cooked in there before). Then you add back in the onions and chicken. And serve it with mashed potatoes, over noodles, or rice, or just with some veggies or whatever. It's your life. Eat rich deliciousness however you want. I'm just saying that I loved it. And can't wait to make it again. And I think you should try it. Cuz it's tasty. And you'll like it. Hiiii guys! I'm working a wedding today (yay!) but let's chat about how this last week went, yeah? Last weekend we went to see the play my old high school did, that I helped direct, and my little sister-in-law was in: Macbeth. It actually went really well and exceeded a lot of people's expectations! I also ran into a couple people I haven't seen since high school, so that was nice! And then we went out to dinner with Michael's fam and best friend (who was the director). Super fun. And other than that...not much else has been going on. Just getting things done, working, and hanging out. Wednesday was Michael's sister's choir concert and then...yeah. This post on Buzzfeed about having a dessert stomach is LIFE. I'm so mad because these pictures DO NOT DO THIS PIE JUSTICE. This is legitimately one of the most delicious things I've made for this blog and I blame stupid crappy rainy-day lighting for the fact that you so have no idea how good these are. Just...trust me. Listen to me. Let me convince you. Ok...I mean...that photo above gives you some idea--right? LOOK AT THE EPIC LEVELS OF GOOEY RICHNESS! So...technically...I've shared this recipe before. 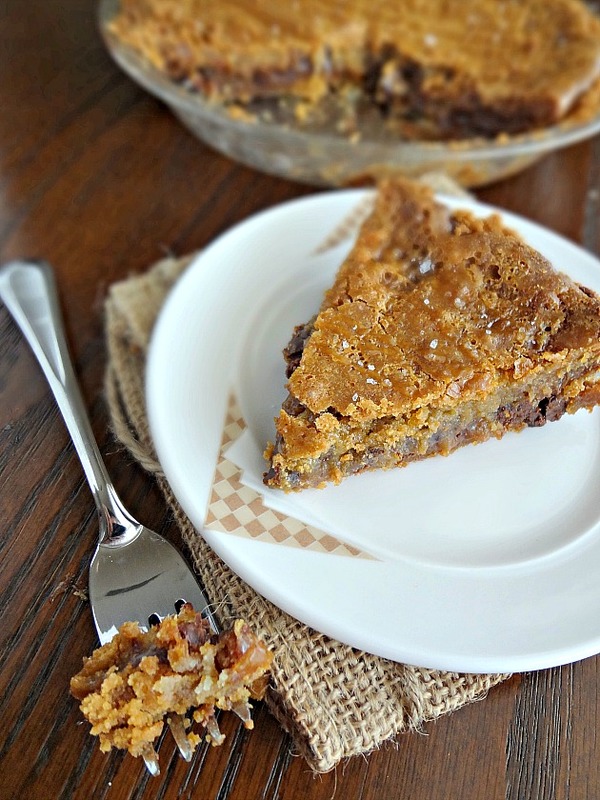 In fact, it was the first recipe I ever posted on this blog: my beloved chocolate chip cookie pie. It has been way way too long since I've made that pie because....well because I have a blog and I have a ton of desserts I want to try so it's hard to re-make things. But I somehow improved upon that originally favorite recipe. Let me tell you how. The original pie recipe calls for melted butter. Which now...if a dessert recipe calls for melted butter....I mean...there's a 99% chance I'm gonna brown that butter. So that's what I did (totally the right call). I also put in a bunch of oh so delicious salted caramel sauce--I poured some on top of the graham cracker crust, drizzled some on top prior to baking AND drizzled some on top after baking. And also sprinkled some sea salt on there. Because when THAT IS HOW WE ROLL. 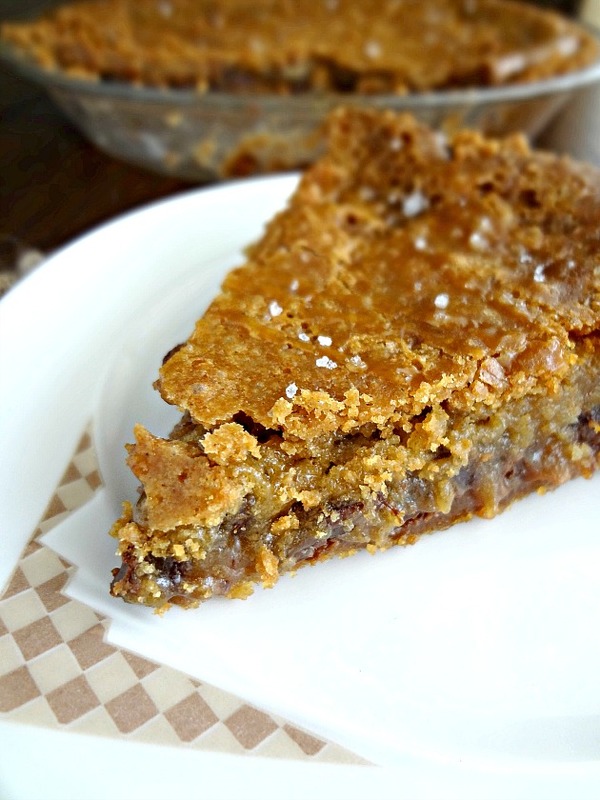 The result is an ultra rich, super gooey, cookie pie (with melty chocolate chips that make you want to do a happy dance) in a buttery graham cracker crust with lots of rich and gooey caramel and the most gorgeous crackled brown-sugary top. And more caramel. And that salt. And...oh my goodness it is seriously the most wonderful sort of heaven. I prefer to enjoy the deliciousness of this pie warm, but Michael loves it cold. You can also just serve it room temperature. 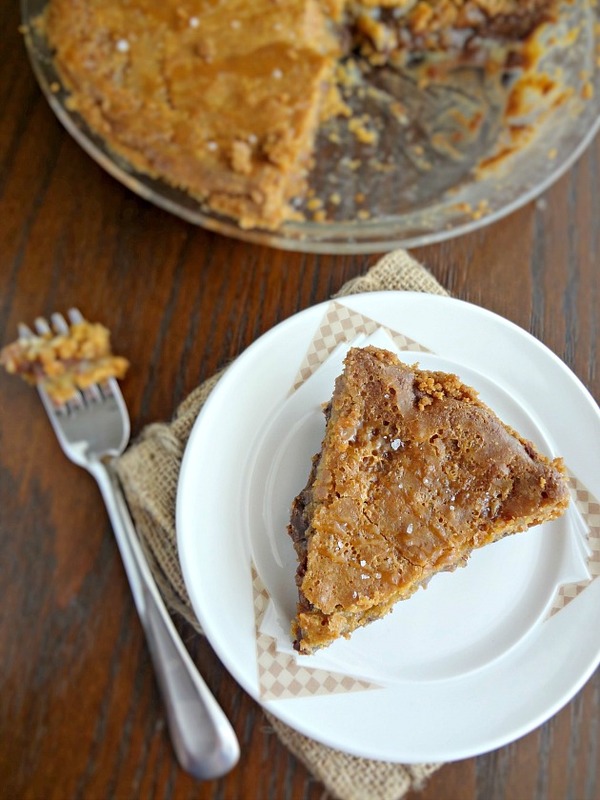 This pie is versatile like that. I just...I cannot emphasize enough that THIS IS THE BEST THING EVER AND YOU NEED IT IN YOUR LIFE. If you suffer from deep-fry phobia, like me, then this recipe is going to appeal to you in the way way it did to me. 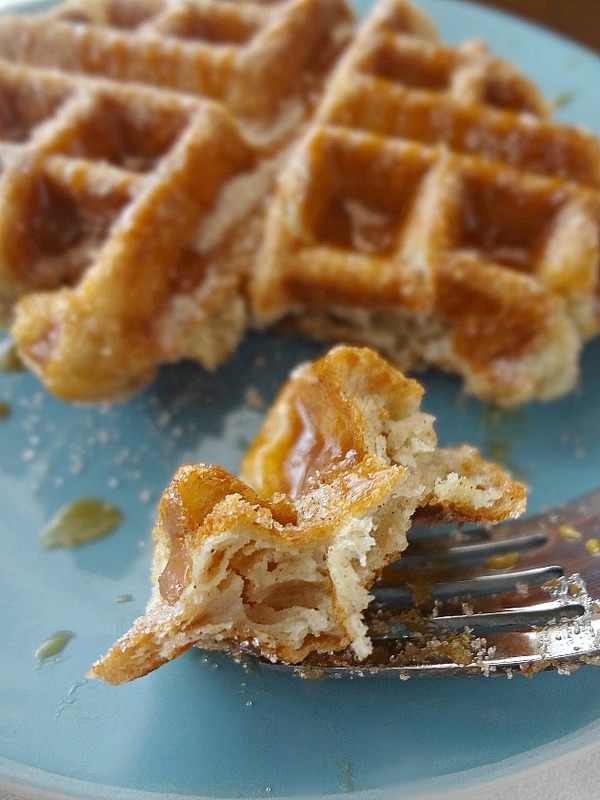 We can have crisped, delicious, churro-waffle hybrids (the batter is actually very similar to a choux-the base that creates cream puffs), without all the mess and calories of frying. 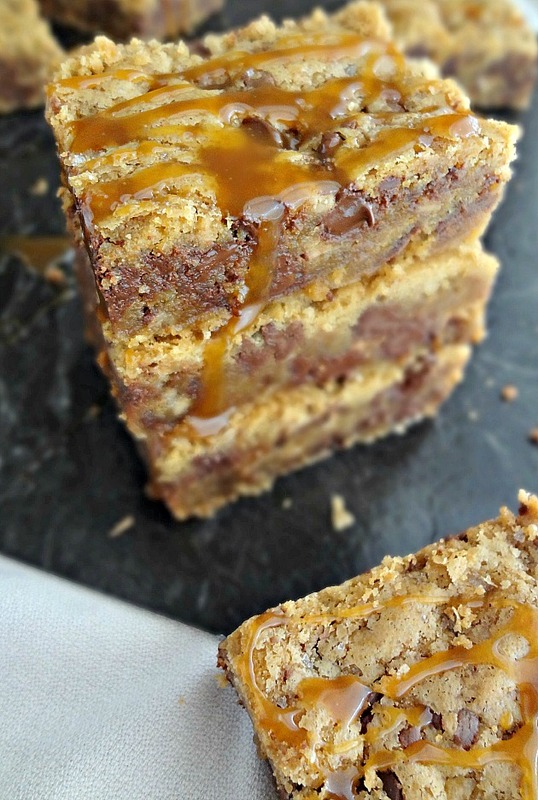 And then I highly recommend you drizzle salted caramel all over that shiz. Admittedly, I haven't eaten that many churros in my lifetime. But I do have very strong memories of people selling churros on the subway platforms in NY. They were always there, beckoning to me, smelling oh so lovely...and somehow I just never bought myself one. One of my life's regrets. 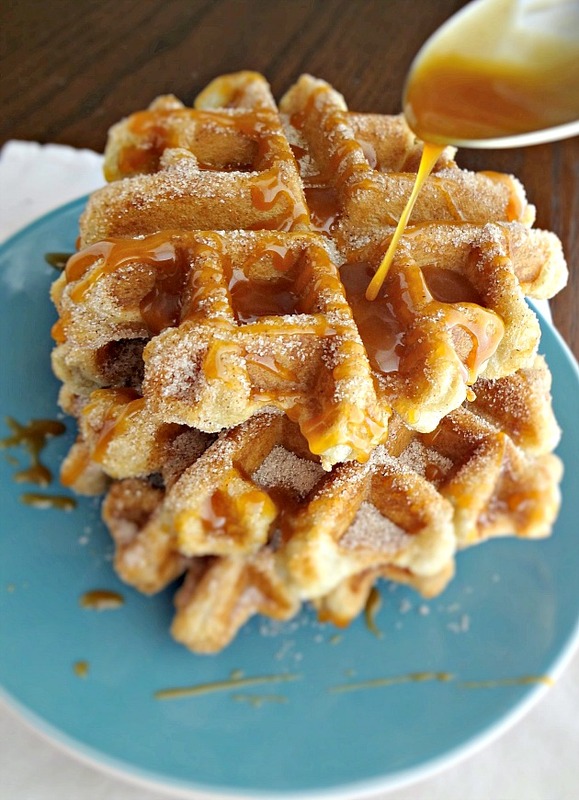 BUT--even though I missed out on those churros, I did partake in some especially delicious and crisp waffles when I was honeymooning in Mexico. And my favorite way to eat them? 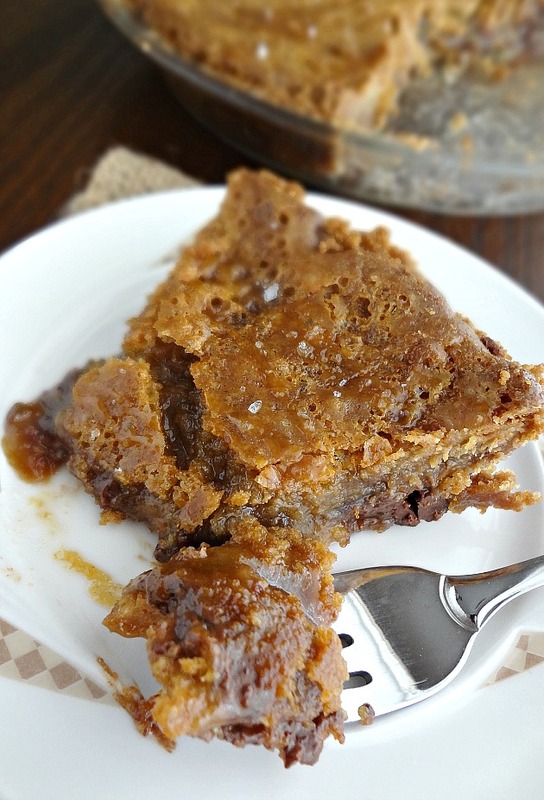 With cinnamon sugar and caramel sauce. 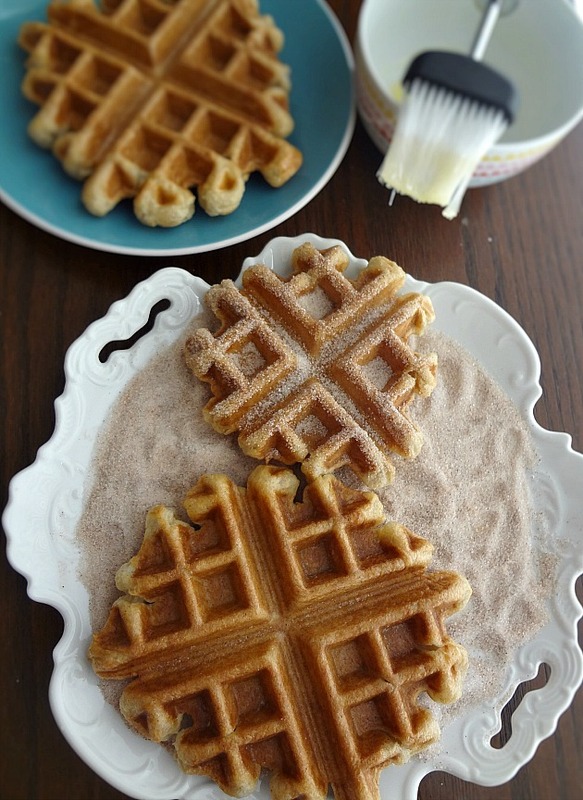 So when I read the recipe for these waffle iron churros, my mind immediately jumped to those waffles in Mexico that I'd loved so much (to the point of me waking Michael up so we could go get some--me telling him I was going to "starve to death" if we didn't.) And I knew I was going to be drizzling my favorite salted caramel sauce on top. Because I make good life choices. 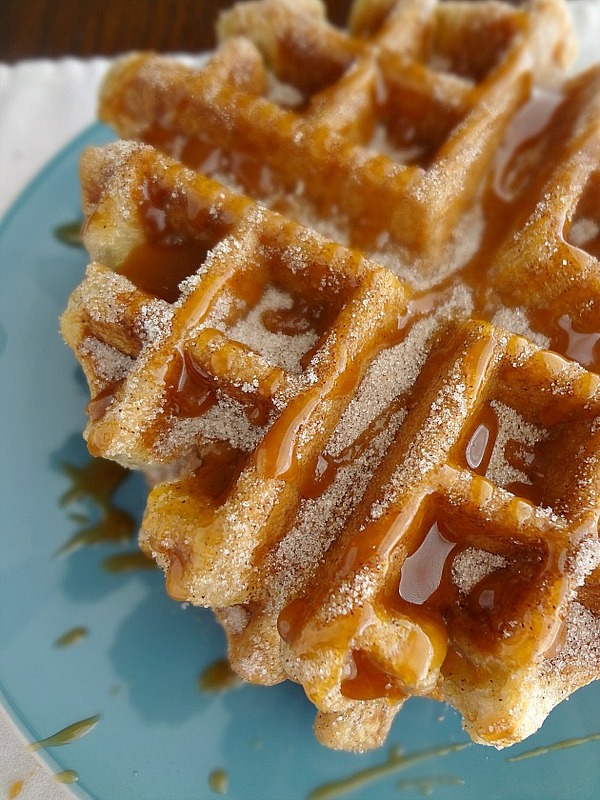 So--the waffles are chewy and and crisp and have gorgeous little specks of cinnamon. Then, you brush them with butter and coat them in cinnamon-sugar. Then you drizzle caramel...or chocolate...or whatever. Doesn't have to be anything. They're delicious either way--but the salted caramel is actually pretty subtle on them. I think it sort of just enchances all the cinnamon-sugariness going on. They're crazy delicious and Michael agrees. It was a real sadness that this recipe only makes 3 waffles. Perhaps you should double the recipe? Yeah, that's probably the right call. Whether you want to know what to make for dinner, dessert, or even breakfast this week-we have you covered! 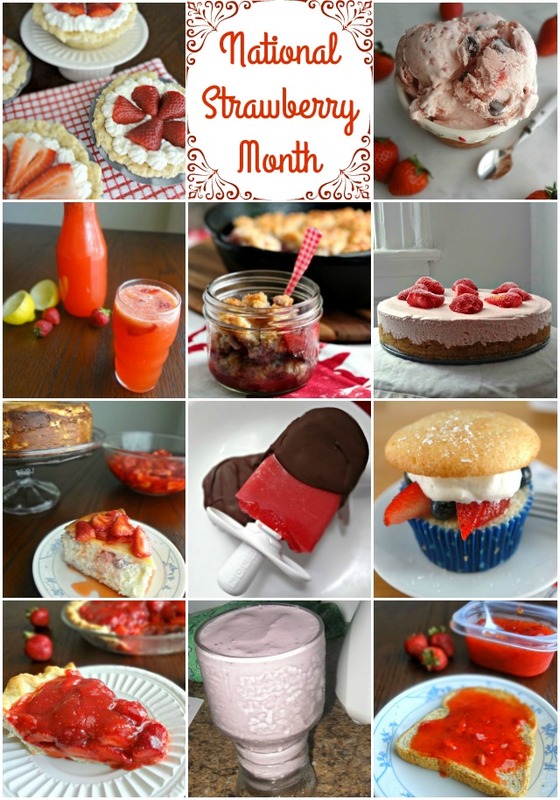 My mouth is watering just looking at some of these recipes!! Last weekend was so fun but SO EXHAUSTING! We had to be at Michael's cousin's reception venue at 9AM to start helping setup (which I am so happy we were able to do because we gave her and her parents peace of mind) and then the wedding was beautiful, the reception was SO fun, and we even spent some time at a hotel with some of the family afterwards. THEN on Sunday we had to be back at the same church at 10:30AM for mass and to witness the first communion of some of Michael's out of town cousins' children. Then we had lunch with my mom and then dinner and hanging out with Michael's mom, siblings, and their S.O.'s. It was wonderful but we were very very tired afterward. These cookies sorta kinda blew me away. Like...I didn't expect cookie made with whole wheat flour and coconut sugar to be JUST AS GOOD as really really good chocolate chip cookies. Michael made fun of me because I ate 3 of the cookies the day I made them, and a fourth the next morning. 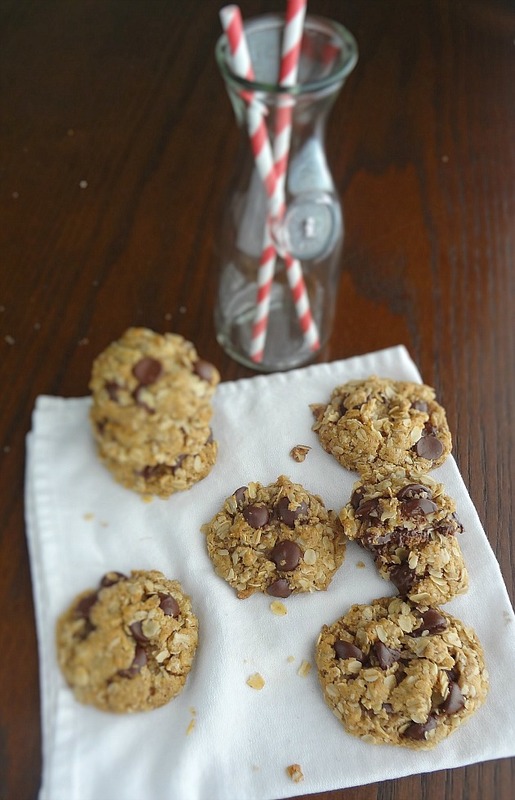 --The recipe only makes 10 cookies so I ate nearly half within 24 hours. BUT THEY ARE SO GOOD! And they're definitely infinitely better when fresh-make sure to keep that in mind. They get less good every day that they're leftover. They do stay soft, though! Which is pretty nifty. Now....these are definitely not really healthy cookies. I mean...they still have butter. But a little extra betterness in the form of white whole wheat flour (DO NOT substitute regular whole wheat flour, it will not taste the same. White whole wheat flour has a lighter texture and more mild flavor) and coconut sugar never hurt anyone, did it? Nah-it's a nice little perk. 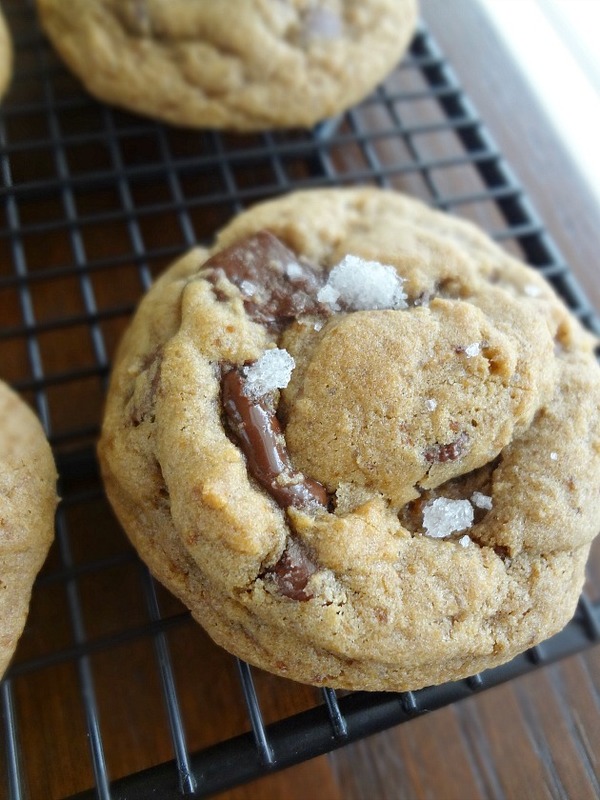 A perk that seriously--when you have one of these cookies fresh and warm...you'd never know. 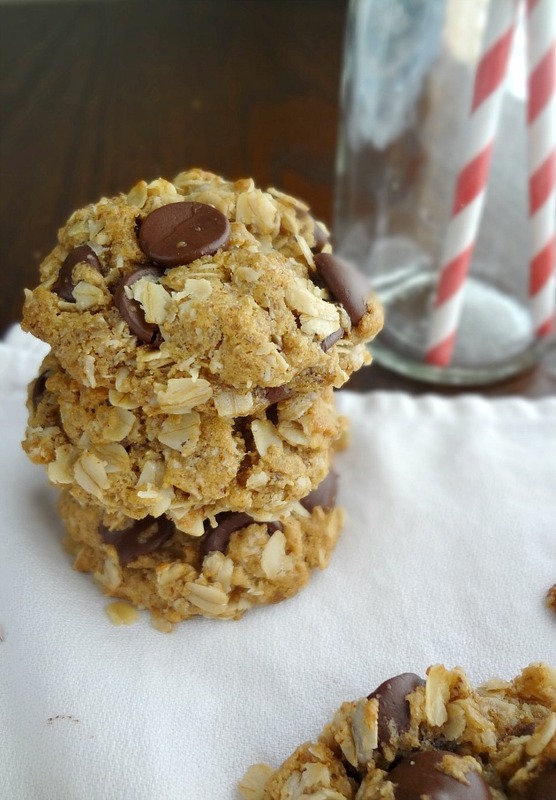 You'd just think, "These are some darned good chocolate chip cookies!" So. 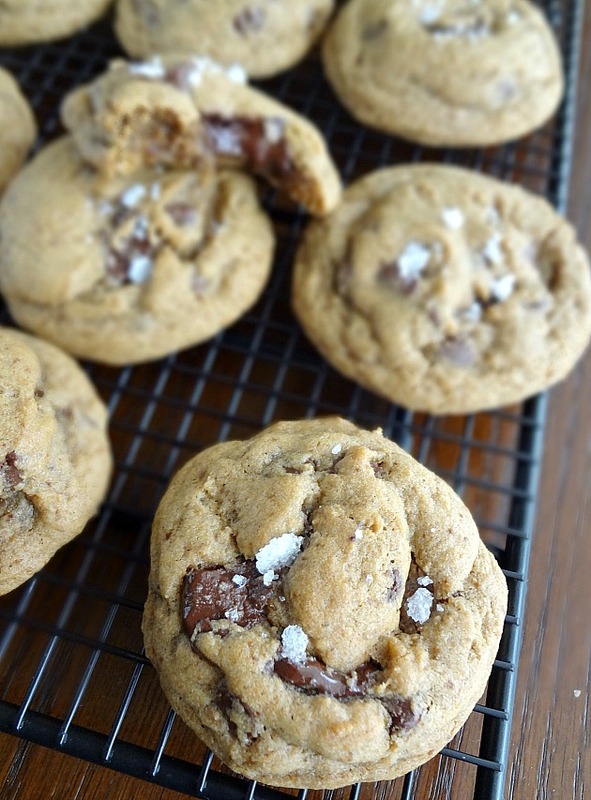 Do we like soft and chewy cookies with complex flavor? Do we like melty dark chocolate contrasting with little bites of sea salt? Do we like deliciousness? You're here. Of course you do! These cookies are pretty miraculous. They're really delicious, and chewy, and awesome. 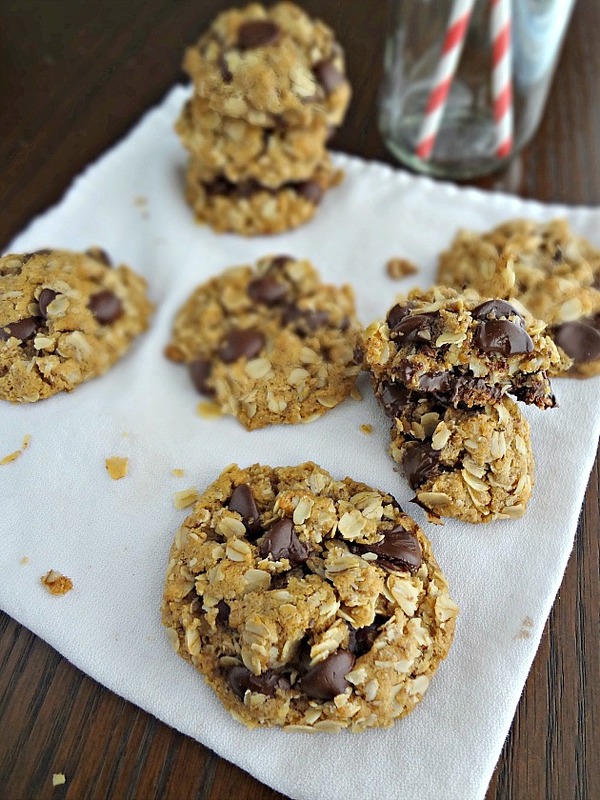 They also happen to be gluten-free and (if you use vegan chocolate chips) vegan. I know. Like I said-miraculous. BTW--HOW adorable is that little glass bottle thing in the background?? Michael's mom has a few of those on display in her dining room and I've been eyeing them for awhile. Since she's moving, she's trying to get rid of a lot of stuff, so she happily gave me one! (She offered to give me a bunch more stuff but...I don't have the space lol) I knew they'd be perfect to include in a cookie shoot and i was right! But you know. You do you. Lately...I've been craving guacamole. And I haven't been able to get it (I keep meaning to go to this one Mexican restaurant we love but it hasn't happened yet) so...I finally just decided to make my own. Because that's what we food bloggers do. Or...at least...that's usually what I do. 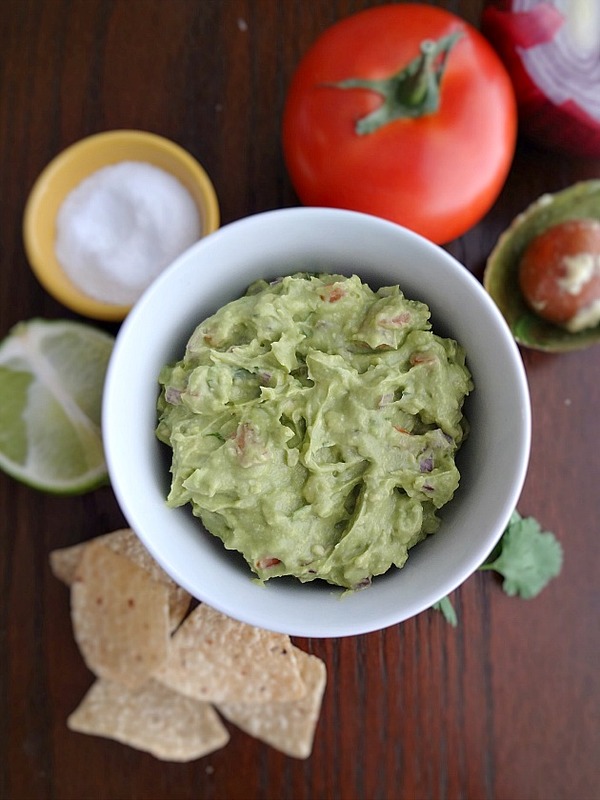 And really...there's no reason that all of us shouldn't make our own guacamole! IT IS SO EASY! And insaaanely quick to make! Funny fact--apparently my dad and grandma (heck..probably all of my grandparents) have never tried guacamole. And one time (a time my brother and I still enjoy a good giggle over) my mom pronounced guac "GWYE-ACK" (admittedly on accident--she does know how to correctly pronounce it). So...I don't come from a particularly adventurous food background. But somehow...I love guacamole. And I am so happy that I do. First a little tip on avocado ripeness--you're going to want the avocado skin to be very dark and have give when you squeeze it. If it's suuuper soft when you squeeze it-it may be over-ripe, but you can still cut it open and use any parts that are still green and not brown! 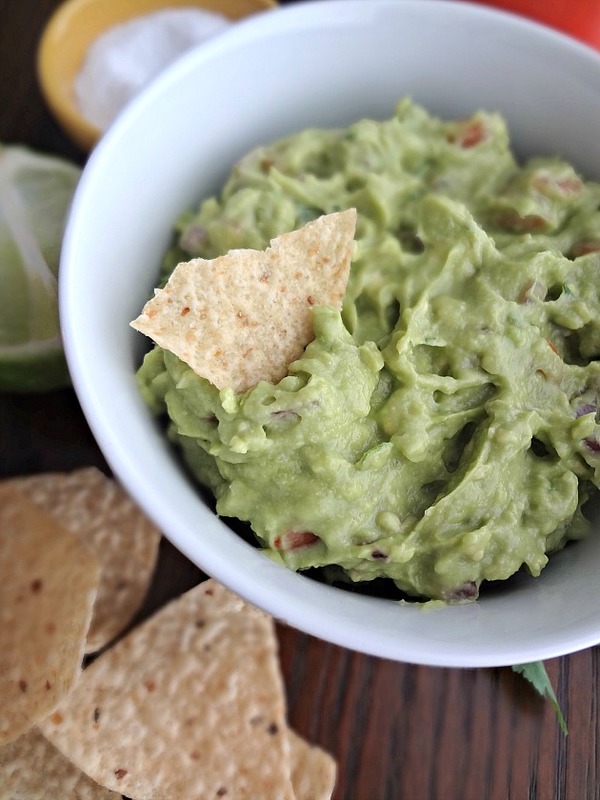 Another tip for good guac is DO NOT BE AFRAID OF SALT! Seriously...you're gonna want to be generous. And also, this recipe is definitely one of those taste and adjust sort of situations--some of the ingredients aren't going to have amounts because you should sort of just add however much tastes good to you, you know? I know the first time you make something that is super frustrating but I promise after you make it once and figure it out...it just makes sense! Oh and after you've made the guacamole, if you don't finish it and want some leftovers and are concerned about it turning brown here's another little tip: spray the top of the guacamole with cooking spray and cover the top with plastic wrap (so that the wrap is pressing on all of the guacamole)--it helps! Avocadoes are potentially the only thing that I like and Michael doesn't, so I had to eat all the guacamole myself. Which...even though it didn't look like much...it actually was. So this might be best to serve if you're entertaining or have at least a couple people to eat it--because I had a difficult time finishing it by myself. Also--don't limit yourself to eating this deliciousness with just chips! Quesadillas, flautas, and even french fries are so good dipped in the guac and it's also tasty on sandwiches! 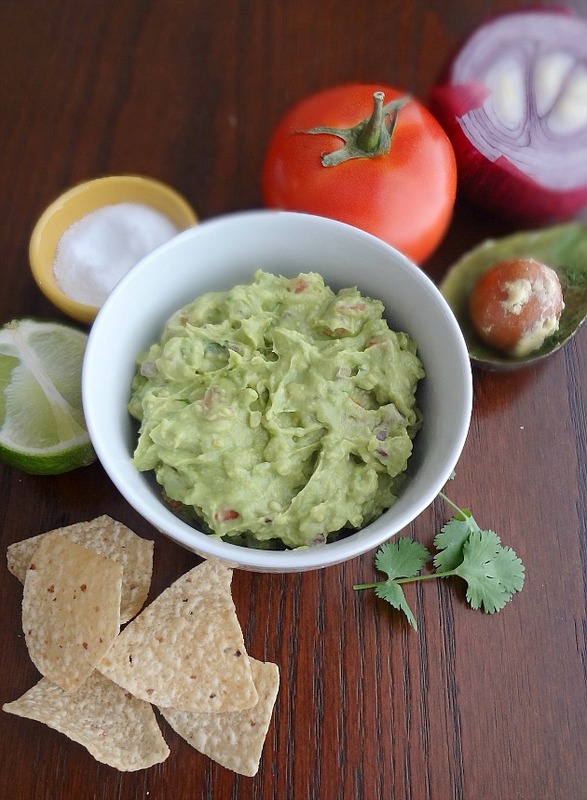 Guacamole is too good to only enjoy one way. I have one word for all the meals shared this week: YUM!